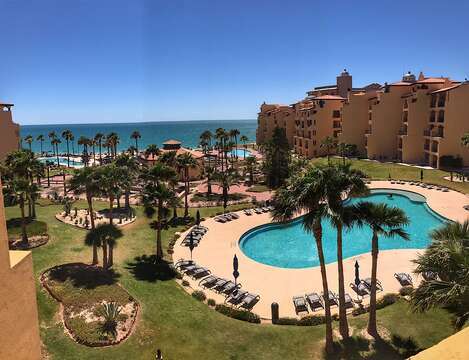 The Princessa de Penasco is one of the most quaint and beautiful resorts on Sandy Beach. This resort has a beautiful beach front swimming pool, kid’s pool, Jacuzzi and a state of the art fitness center. The resort also has another pool in the back of the complex. You can lay under the palapas on the resort lounge chairs or sunbathe by the pool. The resort also has a restaurant and bar called Agave and an on-site convenience store in the check- in office. You will not be disappointed with the accommodations of this family friendly resort. This condo has 2 bedrooms and 2 bathrooms. You will find this particular unit ocean side on the 2nd floor of the A Tower. This condo can accommodate 6 guests; 2 in each bedroom and 2 on the sleeper sofa in the living room. The walls of this condo have been Venetian plastered in a soft yellow color. The living room has been decorated with one big plush orange sofa and a plush navy blue love seat. The furniture suite also includes a lighted wood end table, low profile wood coffee table and a beautiful wood entertainment unit. The entertainment unit has a large TV, DVD, VCR and stereo. The condo has high speed wireless internet. You can get to the terrace by walking through the sliding glass doors off the living room. The dining room has a square shaped glass top table with four white metal backed chairs. The dining room has a white metal framed mirror hung in the wall behind the table. The kitchen has white on white appliances with white cupboards and ceramic tiled counter tops. The kitchen includes a bar that has white metal bar stools with rainbow colored seating cushions. The kitchen has all the tools to create delicious meals. You just need to provide food and beverages. The master bedroom has aqua blue Venetian plastered walls with a king size maple wood bed and pink floral bedding. The room includes a lighted bed side table and dresser. The room has a large window that faces the ocean with a small closet on each side. There is a storage compartment below the window that is perfect for storing your luggage. The master bathroom has a single sink vanity with a private tub, shower and commode. The 2nd bedroom has a queen size bed with an arched wood head board and red patterned bedding. The room has a set of wall mounted bed side lights and a dresser. The room has a closet to store clothing and a window that looks out to the front entry of the condo. The 2nd bathroom is in the hallway and includes a walk in shower with a single sink vanity. The terrace has a black wrought iron dining table with four matching chair. The terrace is great for a sunset meal or for happy hour with friends and family. The condo also has washer, dryer and ceiling fans throughout. You will be so delighted with the accommodations in this condo. 08/27/18 01:56am Daniel Really enjoyed our stay, already can't wait to be back..
04/23/18 04:04pm Ramero Hotel was absolutely wonderful! Stunning views & room was so beautiful as well. I've been staying at this hotel for the past six years always bring new people with me and telling everyone about it. Thank you for having us. Only thing I would comment on would be maybe staffing the lobby with more people.